Domestically developed HÜRKUŞ-C armed close air support aircraft's self-protection feature was successfully tested in capital Ankara's Kahramankazan district, announced Saturday. HÜRKUŞ- C is the armed version of HÜRKUŞ-B training aircraft, both of which were designed and upgraded by Turkish Aerospace Industries (TAI), the country's pioneering institution in aviation engines. "Besides being a training aircraft, HÜRKUŞ is preparing for its close air support duties with its weapons and protection systems," Defense Industry Chairman Ismail Demir wrote on his Twitter account. 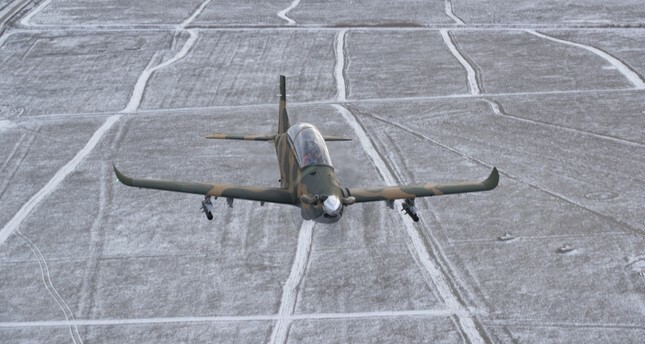 The HÜRKUŞ series are being developed to provide close air support to the Turkish Land Forces Command and Gendarmerie General Command in operation areas in addition to meeting the training needs of the Turkish Air Forces. The first shooting experience of HÜRKUŞ-C was carried out with the national defense contractor Roketsan's LUMTAS missile in Turkey's central Konya province and since then, the tests for new features and different ammunitions are being carried out. The latest version of the HÜRKUŞ-C series will have a weight of approximately 5 tons and be able to carry 1.5 tons of payload. The domestic aircraft will be able to perform day and night surveillance with the infrared metering multi-band camera with laser pointing capability and will be able to perform missiles and bombs when necessary. It will be able to stay in the air for up to six hours with an elevation of 35,000 feet. Based in Ankara, the TAI is serving the aerospace and defense industries by manufacturing unmanned aerial vehicles, aircraft, helicopters and satellites, and their components. TAI was established in June 1973 under the auspices of the Ministry of Industry and Technology in order to reduce foreign dependency in the country's defense industry.